Spike is a human who was turned into a dog. You know that, Primo. Last edited by _Stu_ on Fri Sep 28, 2012 5:27 am, edited 1 time in total. Get ready for the next juggle! I'm not sure if that look on Primo's face means he's sorry for saying those things or if he's doubting Spike even more. I don't know. It seems that something major is going to happen here between Spike and Primo. Seems to me like Primo is going to do something stupid, and Spike is going to punch him. Last edited by _Stu_ on Tue Oct 02, 2012 5:50 am, edited 1 time in total. That wasn't very smart, Primo. who ever said Primo was supposed to be smart? What really upsets me about this development is that Primo didn't trust Spike enough to start talking with him in a civilized, rational manner. Instead, he jumped to conclusion. hey, Primo, what's the matter: afer all, Spike saved you from kidnapping, saved your life...what, twice? Then, yes, came to live with you because YOU asked for it. Oh, yes, and there was that other matter: Spike is on the run after being guineapigged into being a dog, so of COURSE he has no enemies to hide from. yes, Primo, very very nice doggie you are. And yes, Primo is a bit rash, always has been. Why he always needs to be rescued. He's a little more than a puppy after all.......... but! Why do I get the feeling this is a fake recording? hmm, tricky: if the video was taken back when Spike (as human) escaped, then it's a fake because the transformation was not complete then. Or, the video was taken after Spike fought off his first posse. 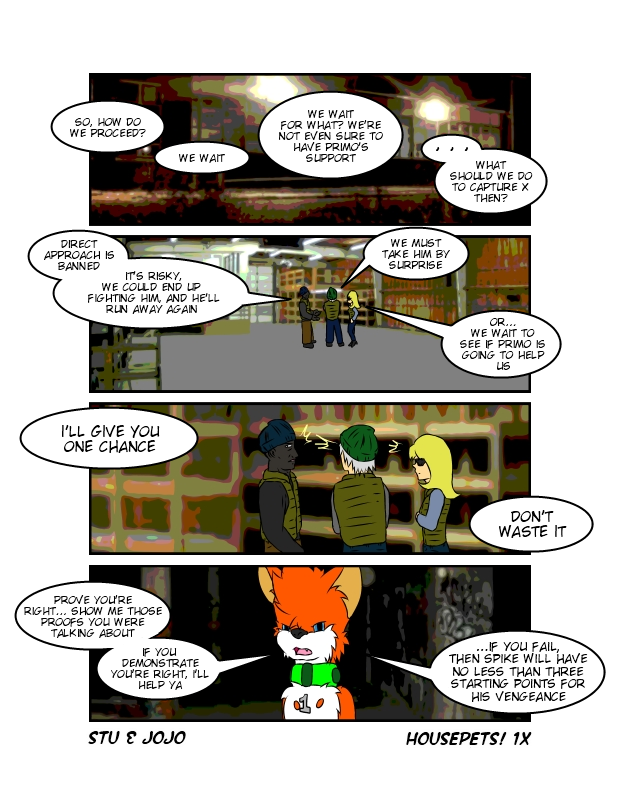 I forgot, but did the previous test subjects appeared in the comic? Because I somewhat still believe they're trying to mass clone Matt. wasn't it established that Eyesight was a previous test subject? only Eyesight, who is number 2... for now. ...wow this is surprisingly sad. I hope he gains enough courage soon! a famous actor has short budget? Even though they live in a mansion with several rooms? no reason to be ashamed of a little friendly cuddling, especially with pets. Quite sad indeed.... let us hope Steven can talk to his mother one day. I wonder how old he was when he volunteered? He cannot have been that old. Poor Primo. Soon he will know all, from the mouth of Spike. And that's how Primo will suffer for doubting spike. Poor Spike, not having the courage to talk to anyone about his emotional turmoil. Poor Primo, being tricked like that by the fools that were previously mentioned. Just poor individuals all around. Last edited by _Stu_ on Wed Oct 10, 2012 2:01 am, edited 1 time in total. The true trap is the repetition of the word "Primo" for three times in a row! Last edited by _Stu_ on Thu Oct 11, 2012 3:51 am, edited 1 time in total.